From Oak Cliff to Iran. Tehran’s First Better Block Project! Check out our latest video where we discuss the elements of a better block, including the concepts of “complete streets”, and the missing pieces that create a livable place. 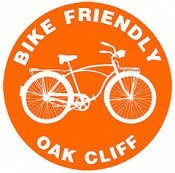 Community Gardens of Oak Cliff have an official web presence now. Go here to catch up on all of the latest details on the different gardens around the Cliff, and sign up to get involved. The Streetcar is Returning to Oak Cliff!